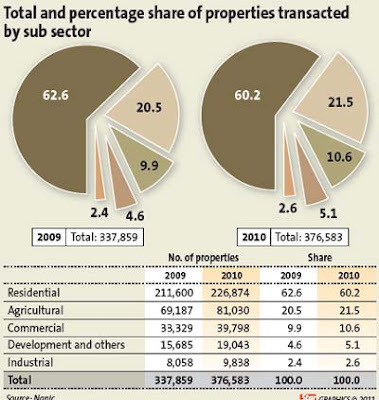 Malaysian property prices are expected to increase at an average of between 10% and 20% this year, in light of rising inflation and increase in demand for local properties from foreigners, said Deputy Finance Minister Datuk Donald Lim Siang Chai. It is a reverse scenario in China. High inflation drove China Central Bank to raise interest rate few rounds already. That is actually slowing down property price escalation as reported in the statistic in Mar. Now let's just see if our salaries and wages will rise enough to offset price inflation. Every month more money goes into basic items like food and petrol, etc hence less disposable income. 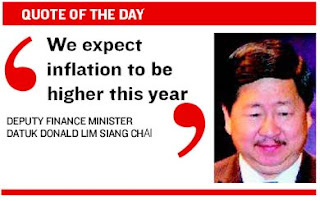 BN will raise rates - not if, but just a matter of when. As I think we all know to the answer. I do not know why a deputy finance minister would want to make comments on the future (and therefore speculative) price of properties. Donald duck should stick to his job of providing the people with good quality of life. maybe he is helping developers to sell their back log properties ? That's one possibility. So that his developer friends won't forget him when in case next election really no support for MCA, he'd be out of job (as per party chairman).